With 5 children, I have to rely on systems of organization for my own sanity! 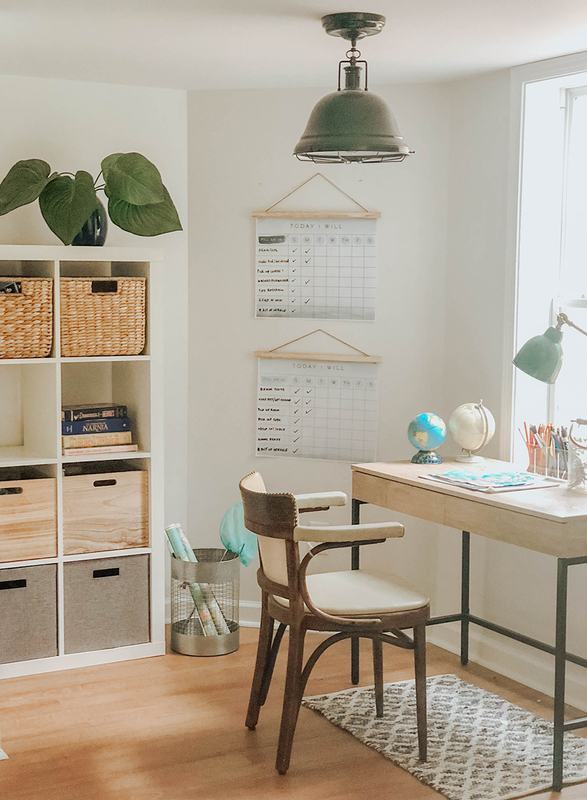 I wanted to show you a closer look on how we (attempt to) keep clutter under control, where we store things for the school year, and some of the items we use for organization. Our living room is where everyone spends the most time, which is why many of the toys from bedrooms and the basement wind up here. It has helped to have catch all drawers in the window benches for when we do quick clean ups. We also use these benches for children’s books, and school books. The kids can access them easily, and know where to return them during family clean up sessions. 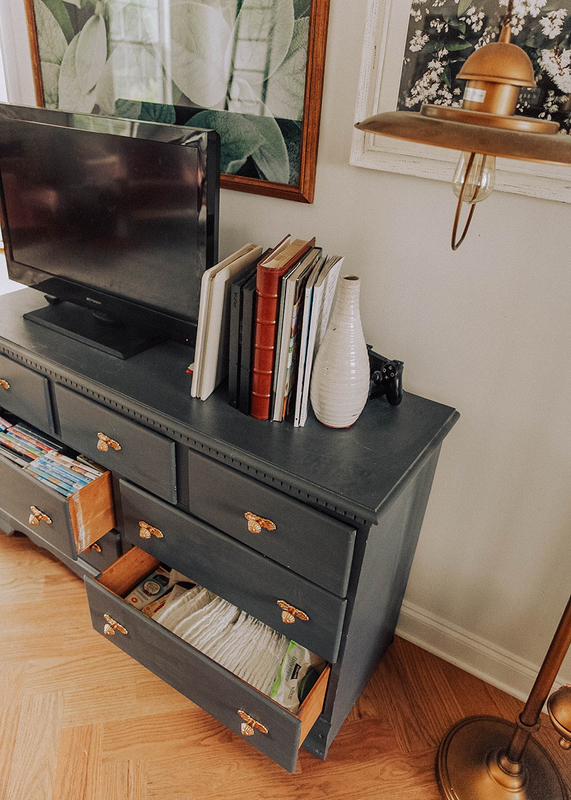 Our media console is a dresser I re-finished to use for additional storage. We keep chargers and wires, cards and games, dvds, diapers, and little shoes all within these drawers. It is easy to access, but keeps so much clutter out of sight! It really does free up your midn when you can at least somewhat see the floors and corners of your home. I am one of those people who cannot think much beyond the state that her home is in. I have given up on having it clean at all times, but as you can see I won’t go down without a fight! 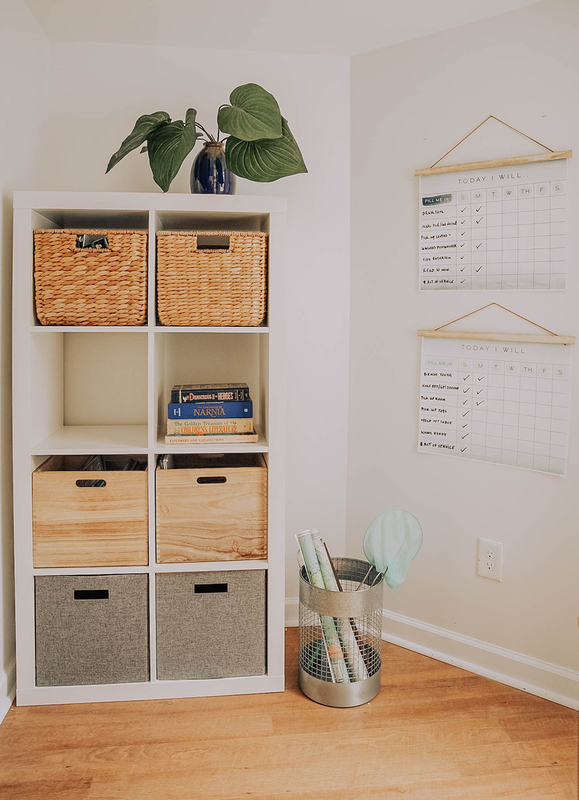 We will be doing the hybrid school system again this year, so on the days they are home, it’s extremely helpful to have bins or drawers for each child to put their books and supplies on the days they are home. That way they always know where to find thing when they need them, and it keeps Gabe and I from hunting backpacks and bedrooms for missing items. 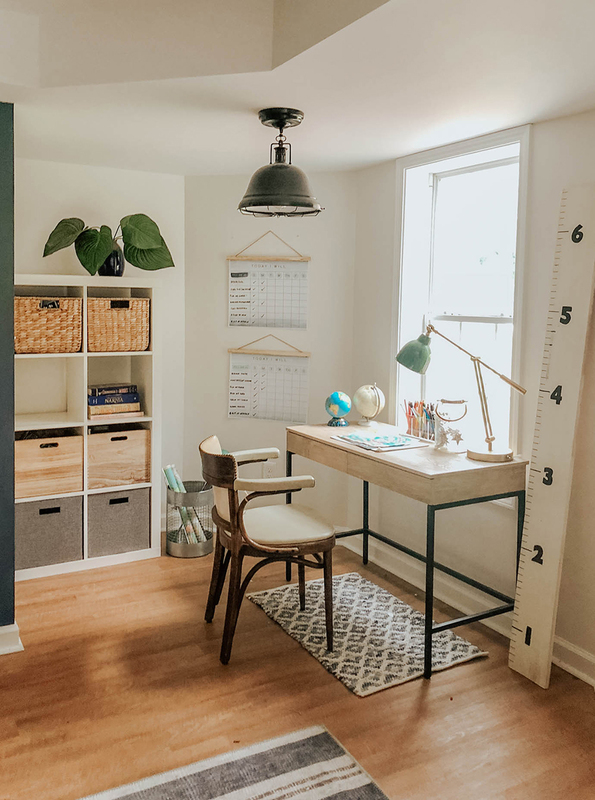 This shelf unit from IKEA fits so many of their school binders, art supplies, and toys to easily access. If you don’t have an IKEA near you, this is a similar one. 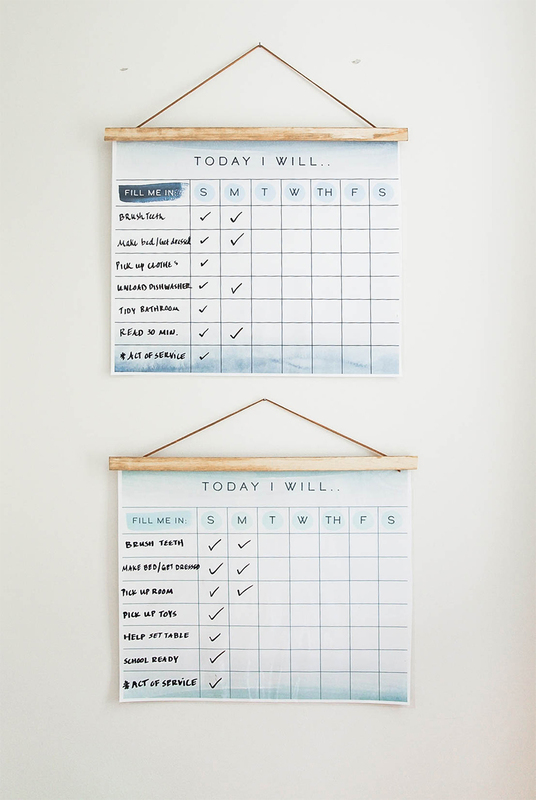 I created these “Today I Will” responsibilities and chore charts to help them visually engage and motivate them. If they complete a week, they get points towards a prize. (ie: 10 points for a week, 50 points to redeem for a reward.) We don’t do allowance for daily chores, so this has made them really eager to check off those boxes! The charts are available in two colors. I printed one for Gabriel, Max, and Veronica, and had them laminated at Office Max so they can be used with dry erase marker. That way, I can change according to the month or according to each child. I then stapled them using this easy poster hanger DIY. On the other side of the boys room I have more baskets for puzzles, books, and cars. We have a few rules that help keep their rooms from becoming a pig sty, although it often becomes that all the same. Each morning and night they have to do a quick room pick up, and we have a rule that you have to put away your toys or games before getting out another one. 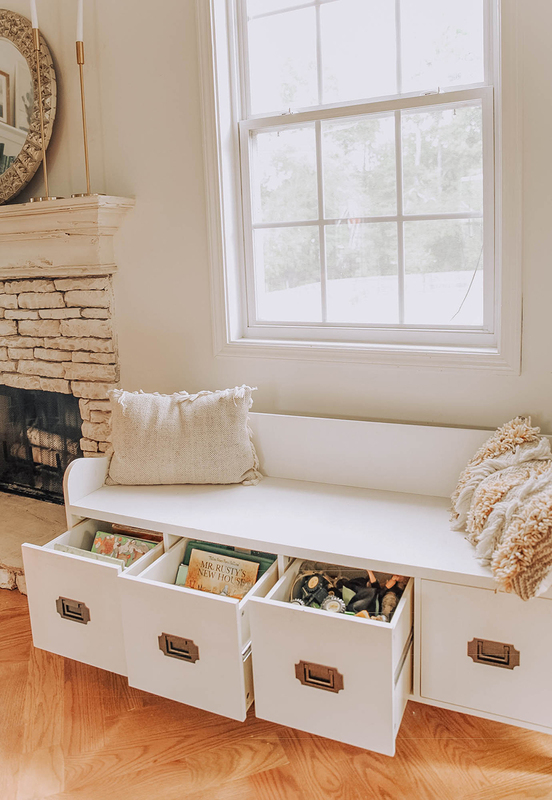 The baskets pictured are from IKEA, and I put two of these storage cubbies together from Target to create a window bench. We have a toy storage closet we had built in underneath the steps in the boys’ room, and that has also been a lifesaver! We minimize the amount of toys we have every few months, and also rotate some in and out of storage to make them feel new to the little ones;) I hope this post was helpful for you. I have slowly been going through drawers, cabinets, and boxes in our home to create more order. I see how much it affects my kids and I in overall day to day mindset and flow so it’s a good investment of time! I love this post! So helpful! I can so relate because I often struggle with being overwhelmed by messes and clutter with 3 boys under 4. 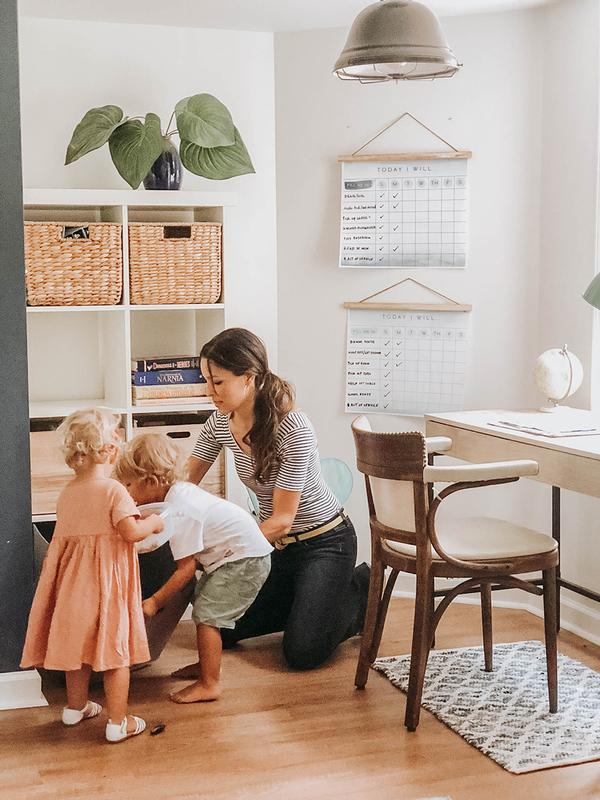 I love how your blog encourages me to create beauty and order in my home – not just in vain – but so that I can be more peaceful and present and love my family well. Thanks for all that you do and for your inspiration to lead a faith filled, intentional, beautiful life! Nikki- thank you so much for your words! It is something I have to always be fighting for, and I so appreciate the encouragement. I am with you on the messes. I don’t think I will ever not be bothered by them, but it does help to have drawers to hide them in when we can – ha! Did I miss the link to the window seats? Storage is our biggest issue in our living spaces! I love how you fit the organization into the overall design of your home to keep it looking nice and clutter free! That is something I’m always striving for in my home! This is such a beautiful space! I’m sure it feels so good to have things ready for a fresh new school year. We are working on the same thing around here and I’ve been praying for a fresh chore chart idea. I love how it’s simple and pretty to look at. Plus, I love how you’ve shared where to print, and even how to make the hangers!! Thank you!! P.s. Amen to tons of storage that hides the toys and things. When we walked in to our home to view it before purchasing all the shelves with doors in the living room were so exciting to me for this reason. So so nice! Love this as a fellow hybrid Mom. FYI. There are a few typos… you said “on the days when they are home” twice in the quote below. Up higher I saw 2 more… “midn” instead of mind and “thing” instead of “things”. You are great writer so I know you were probably just going quickly. 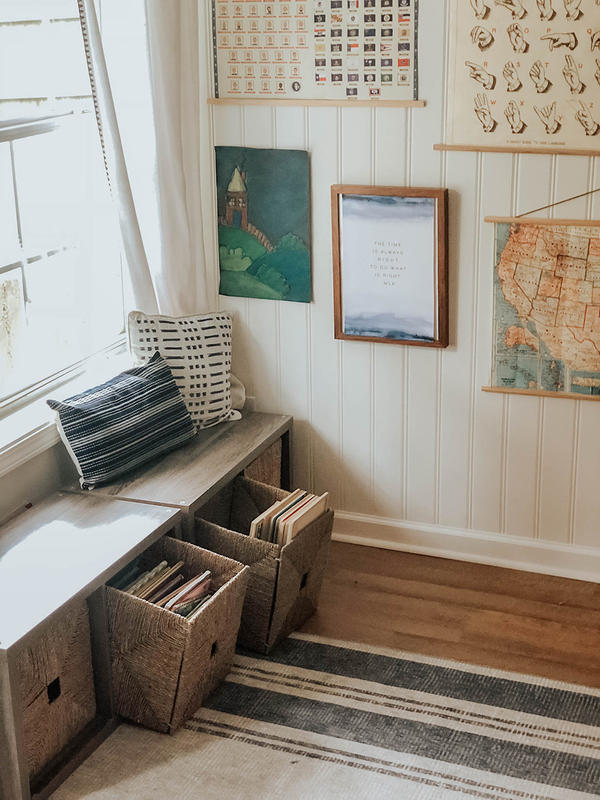 “We will be doing the hybrid school system again this year, so on the days they are home, it’s extremely helpful to have bins or drawers for each child to put their books and supplies on the days they are home. I really feel inspired to incorporate acts of service in our daily life. We do daily gratitude, but this some how seems one step further. Thank you for creating these. This will be used in our “home learning” space. Also, can you link the cage basket? would be really perfect for our yoga mats storage. 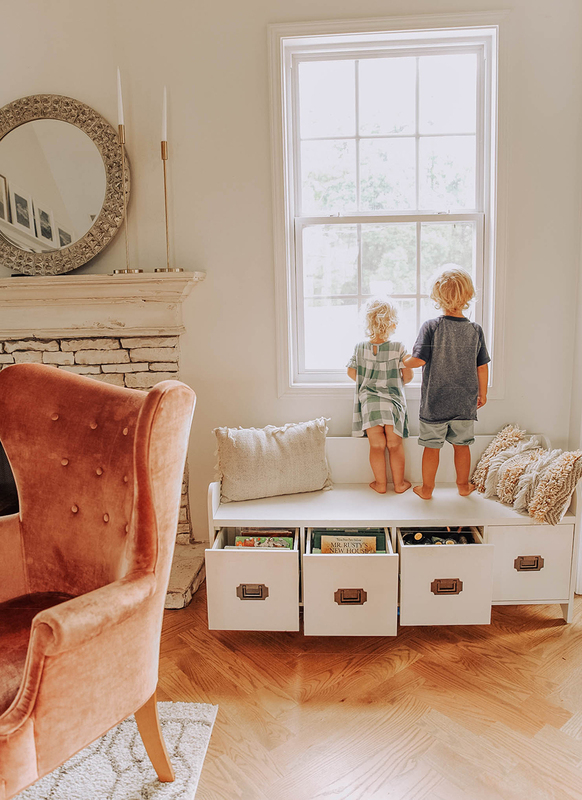 Question- where are the wicker baskets in the boys room “window seat” bench from? Thanks so much! I found those at IKEA, but I believe Target might have some.